Ask and you shall receive. Three U.S. House lawmakers recently unveiled legislation they said would provide common-sense fixes to hours-of-service issues certain truckers are facing. They call their bill the HOURS, or Honest Operators Undertaking Road Safety, Act. 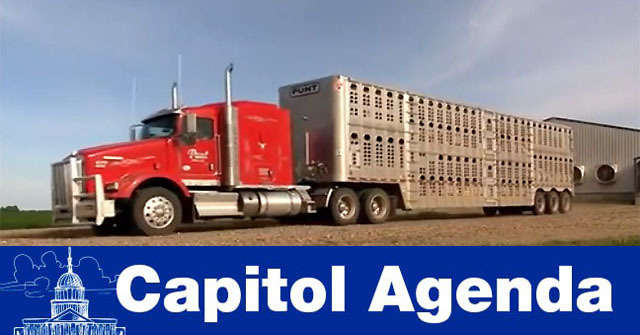 And, essentially, under the measure, truck drivers who haul agricultural products or livestock would be exempt from HOS rules within 150 air-miles of their load’s source. Shorthaul drivers would see an exemption from ELD requirements if they operate within 150 air-miles of the reporting location and complete their workday in 14 hours. Additionally, commercial drivers would just be required to verify their daily on-duty start and end times. Transportation policymakers Reps. Rick Crawford and Bruce Westerman, both Arkansas Republicans, as well as Rep. Sanford Bishop (D-Ga.), a member of the Appropriations Committee, are the lead sponsors. “Those who carry the goods and agriculture products we rely on everyday should not be hindered by nonsensical regulations,” Crawford explained. “While the recent implementation of the electronic logging device mandate has helped make our roads and highways safer, it has highlighted the need to reform the hours-of-service rule that is the driver behind many of the issues our truckers are facing today,” Westerman added. American Trucking Associations expressed its support for the legislation. The House Transportation and Infrastructure Committee has yet to indicate when it would consider the bill. June 25, 3 p.m.: The Heritage Foundation hosts Sen. Charles Grassley (R-Iowa). June 26-29: The International Gas Union holds its 27th World Gas Conference. Speakers will include Energy Secretary Rick Perry and Sen. Bill Cassidy (R-La.). June 26, 9:30 a.m.: The Washington Post examines the tax law with Rep. Kevin Brady (R-Texas); Caroline Harris, vice president for tax policy and economic development and chief tax policy counsel at the U.S. Chamber of Commerce; Aric Newhouse, senior vice president for policy and government relations at the National Association of Manufacturers; Christopher Shelton, president of Communications Workers of America; and Dave Camp, senior policy adviser at PricewaterhouseCoopers. June 25-26, 9 a.m.: The Federal Motor Carrier Safety Administration meets to finalize its recommendations on the revision of the handbook for medical examiners on the National Registry of Certified Medical Examiners. June 27, 7:50 a.m.: Politico hosts Senate Majority Leader Mitch McConnell (R-Ky.). June 27, 11 a.m.: The House Small Business Committee meets for a hearing titled, “ZTE: A Threat to America’s Small Business.” Witnesses will include David Linger, president and CEO of TechSolve Inc.; Andy Keiser, visiting fellow at the National Security Institute in George Mason University’s Antonin Scalia Law School; and Matthew Olsen, president of IronNet Cybersecurity. June 27, 2:30 p.m.: The Senate Homeland Security and Governmental Affairs Committee meets to examine federal permitting. Former Sen. Mary Landrieu (D-La.) will be among the witnesses. Alex Herrgott, associate director for infrastructure at the Council on Environmental Quality, also is scheduled to address the panel. ‘BRING THIS PUPPY HOME’: Road user charges, manifested in the form of a miles-based user fee (MBUF), are the best alternative for sustainable infrastructure funding, according to Rep. Earl Blumenauer (D-Ore.). ROADRUNNER: Two former executives of carrier Roadrunner Transportation Systems were charged June 15 by the U.S. Department of Justice with multiple counts of conspiracy and wire and securities fraud in a scheme that the department claims led to a loss of $245 million in shareholder value. MEDICAL CARDS: Federal trucking regulators have issued a final rule that will delay for three years a streamlined process to eliminate the need for truck drivers to carry their medical certification cards. The Commercial Vehicle Safety Alliance will share the stage with the top truckers in the country during the National Truck Driving Championships awards ceremony Aug. 18 in Columbus, Ohio. Nobody has ever cut regulations. We’re talking about 511 days so far. And you can go four years, you can go eight years, you can go 16 years — doesn’t make any difference. Nobody has cut regulations like we have. Nobody has created tax cuts like we have.